These designs (Phase II designs) include the whole study population to which the same experimental treatment is prescribed, without taking into consideration biomarker status. Useful for initial identification and/or validation of a biomarker. Their aim is not to estimate the treatment effect in a definitive way but to identify whether the biomarker is sufficiently promising to proceed to a definitive Phase III biomarker-guided randomized controlled trial. As all patients will be treated the same way we could compare the outcome of the biomarker-positive subgroup with the outcome of biomarker-negative subgroup. 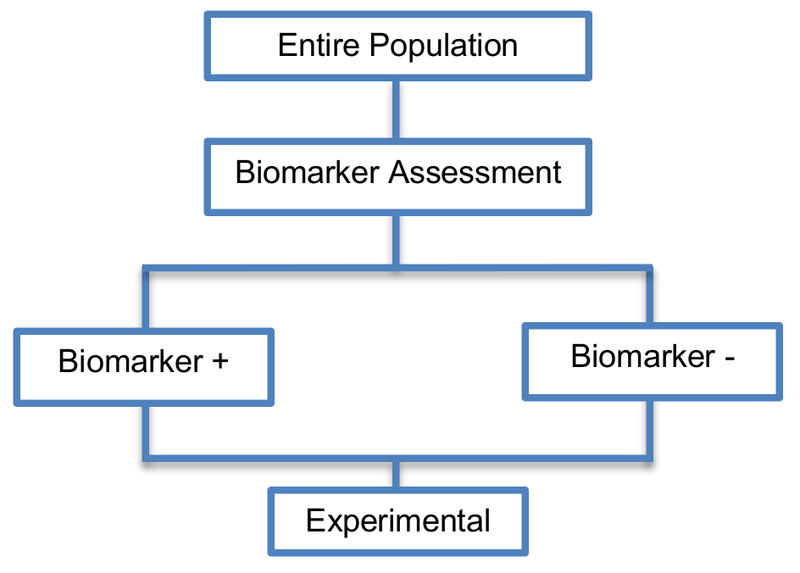 According to Tajik et al., 2012, in terms of the required sample size, a standard formula can be used, however one should take into consideration the multiple testing issue that arise due to the exploration of several prognostic biomarkers (e.g., Bonferroni adjustment or normal exact method to protect against type I error α for multiple tests are often considered). Further information can be found in the paper of Zaslavasky and Scott, 2012 who studied the sample size estimation in single arm clinical trials with multiple testing under frequentist and Bayesian frameworks. In some cases, these designs may be viewed as ethical as all patients are given the opportunity to experience the experimental treatment. However, they may be viewed as unethical if the novel treatment does not benefit a subgroup of patients or causes adverse events. There is no distinction between prognostic and predictive biomarker i.e., as patients are not randomized to experimental and control treatment groups, it is not possible to determine whether an observed effect is attributable to the natural disease progression or to the treatment. Consequently, these study designs are unable to show the benefit of a biomarker with regard to the best choice of treatment.